Journalists were often downright hostile to Led Zeppelin when the legendary rockers were starting out. And the band reciprocated, rarely ever letting reporters close to them. This changed a bit in 1975. Zeppelin carefully selected a handful of writers, editors, and photographers from the mainstream media and even courted the hated Rolling Stone Magazine. They had plenty to cover on this tour too. When the box office failed to open in Boston, fans caused $50,000 in vandalism. And a Bruins hockey game had to be canceled because the rink was damaged. These tales are told in the new book LZ-'75: The Lost Chronicles of Led Zeppelin's 1975 American Tour by Stephen Davis. 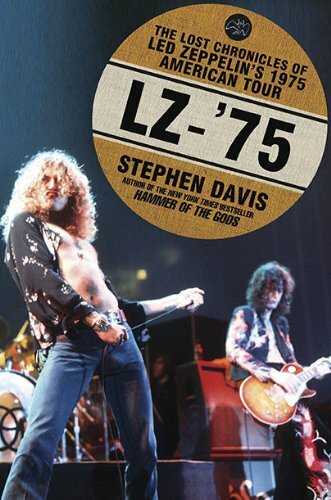 It's a good read, but for anyone who wants the definitive account of Zeppelin, Davis' Hammer of the Gods is the really essential launching point, and perhaps the best rock biography of all time.